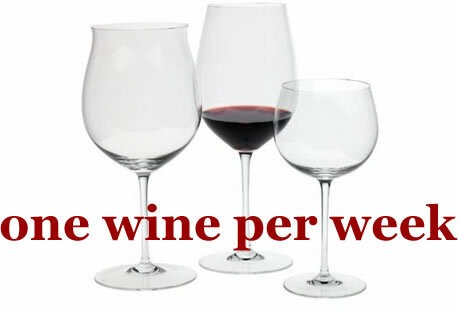 One Wine Per Week: One Wine Per Week -- Why? Like the title says, I (normally) drink one wine per week, which I will try and faithfully review here. Why only one wine? My spouse doesn't drink wine, and I like to have just one glass with dinner, which means a normal 750 ml bottle of wine generally lasts 4-5 days in our house. The rest of the week we're either eating out or eating dry. The two wine preservation systems I use are the Vacu Vin and Private Preserve. I've found that both of them work equally well, and for the purpose of keeping wine fresh over the course of 4 or 5 days, they do a satisfactory job. Is either one better than the other? Not that I've been able to tell... I've also sampled wine preserved under both methods when its been kept over a week and by then there is a noticeable deterioration in quality. But since it's one wine per week, the wine is freshened on a daily basis during the week and I've not experienced any problems yet. Now as far as posting frequency, I'm gonna try and be diligent and write reviews as the title says, but there hopefully will be extra posts during the week, too, relating to wine in some manner.